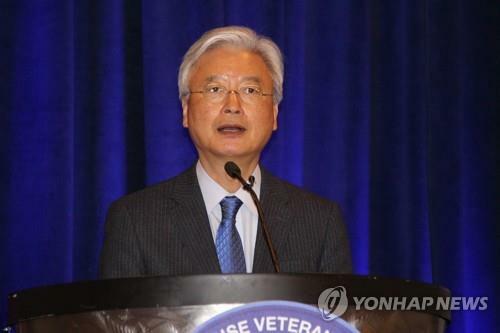 WASHINGTON, Nov. 14 (Yonhap) — South Korea’s ambassador to the United States said Wednesday that he expects the U.S. and North Korea to soon reschedule last week’s canceled high-level talks. The planned New York meeting between U.S. Secretary of State Mike Pompeo and his North Korean counterpart, Kim Yong-chol, was abruptly postponed due to what the U.S. called scheduling issues. Ambassador Cho Yoon-je told reporters the U.S. views the cancellation as a “postponement” and is in talks with the North to reschedule the meeting. Pompeo and Kim were expected to negotiate the details of a June summit agreement between U.S. President Donald Trump and North Korean leader Kim Jong-un to pursue “complete” denuclearization of the Korean Peninsula in exchange for security guarantees from the U.S. The North Koreans have increasingly called for sanctions relief, while the U.S. has insisted that denuclearization comes first. A second summit between Trump and Kim was also on the agenda. The ambassador also said he doesn’t expect the Trump administration to change its North Korea policy after the opposition Democratic Party regained control of the U.S. House of Representatives last week. “The Democratic Party has called for dialogue and a diplomatic solution with regard to North Korea and North Korea policy,” he noted.